Despite a sedition case against her and criticism, Congress’ digital communication chief Divya Spandana on Thursday continued her tirade on Prime Minister Narendra Modi over the controversial Rafale fighter jet deal. Spandana once again took to Twitter on Thursday and posted a still from the just-released trailer of ‘Thugs of Hindostan’ where Bollywood actor Aamir Khan is seen delivering a punch line “Dhoka Swabhaav hai mera (Betrayal is in my nature)”, with the caption “PM Modi to Hindustan Aeronautics Limited. On Wednesday a sedition case was filed against Divya Spandana in Lucknow for referring to Prime Minister Narendra Modi as a “thief”. 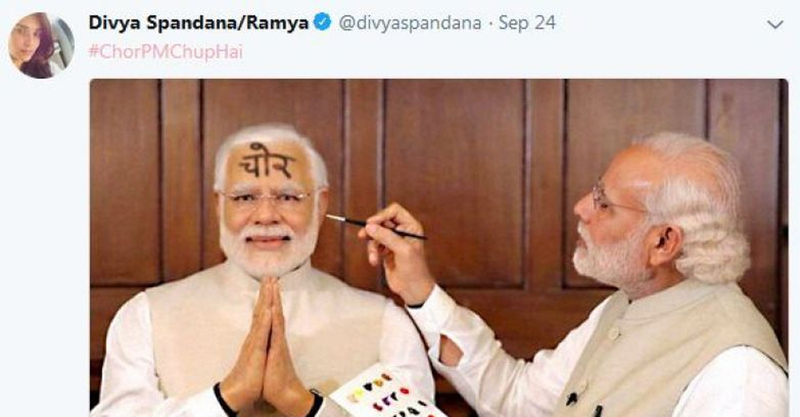 In her tweet, Spandana posted a photoshopped image of PM Modi painting the word ‘chor’ (Hindi for thief) on the forehead of his wax statue. It also bore the hashtag: #ChorPMChupHai. Following her tweet, a FIR was filed against Spandana and a copy of the complaint was tweeted by the complainant, Syed Rizvan Ahmed, who identifies himself a lawyer and social activist. Lucknow police have charged Spandana under Section 124-A of the Indian Penal Code (sedition) and Section 67 of the Information Technology (Amendment) Act on the basis of the complaint. The complaint accuses Spandana of defaming a democratically elected leader and ridiculing India on the global arena. Thanking the Uttar Pradesh police for registering his complaint, Ahmed tweeted that PM Modi and his team should be more active in stopping those who abuse them. “I and my friends on Twitter got the FIR registered because you are the Prime Minister of the entire country, and not any single party,” he wrote. “Her tweet was derogatory. The PM represents our sovereignty and republic. It is a disgrace to our nation, and is a contempt. An FIR has been registered,” news agency ANI quoted Ahmed as saying. The tweet from the Congress digital communication chief comes amidst ongoing controversy over India’s Rafale aircraft deal with France, wherein party president Earlier, Congress chief Rahul Gandhi has accused the Modi government of altering the multibillion-dollar contract to favour industrialist Anil Ambani.